It’s kinda hard to believe eight years have passed since this blog was started. Last year, I drafted this post up on the early side, but this year, I’m kinda waited until the “last moment”, mostly because I wanted to figure out just what exactly I wanted to write. In previous years, the blog averaged 82, 166, 199, 216, 182, 155 and 219 hits daily. Over this past year, 97,401 hits were recorded, just over 266 hits per day, leap day noted. The blog has its niche. Photo sets for construction projects run every month – Collegetown, Downtown, and projects in Lansing/Dryden occupy even months, while Cornell, Fall Creek, South Hill, West Hill and the rest of the county run during odd-numbered months. Fall Creek and Lansing/Dryden switched places this year to balance the workload. Nearly every Saturday at 0000 UTC, there’s “news tidbits”, the weekly news roundup, and if I’m motivated and have time, the other weekly topical post goes up Tuesdays 0000UTC. I like regularity. One of the things that changed up over the past year was with role in the Voice. For the first year of so, most of it was Jeff pulling things he thought would work well for Voice content, and using it nearly word-for-word. But, over the past year, the Voice has had a greater proportion of unique content, so one has to read both to get all the development news. Writing for the Voice on the side of my primary job has its fun times and its stressful times. There’s a lot of curious readers out there, and it’s great to engage with them. The stressful part is time management and just trying to stay on top of everything. In the past year, some projects have finished up – the Lofts @ Six Mile Creek, 206 Taughannock, the Carey Building is virtually complete (what a difference a year makes), 707 East Seneca wrapped up on East Hill, and Ithaca Beer finished their addition. Cornell finished Klarman Hall, and the lakeside mansion at 1325 Taughannock was also finished. The modulars at 804 East State were approved, built and finished by the end of the winter. HOLT Architects completed the renovations for their new HQ, Texas Roadhouse wrapped up, and the Belle Sherman Cottages just sold their last house. Other projects are only just starting their construction journeys. 210 Hancock and Varna’s 902 Dryden were approved, last summer and this spring respectively. Both are expected to start construction this summer. Cornell has started work on the new Breazzano Executive MBA Center in Collegetown, and several block away, John Novarr is building Phase III of Collegetown Terrace. Work is just starting up on Conifer LLC’s Cayuga Meadows affordable senior apartments building on West Hill, while down the road the Brookdale facility is well underway. Some things are still plodding along through review, like the Travis Hyde plans for the Old Library site, and the Chain Works District. 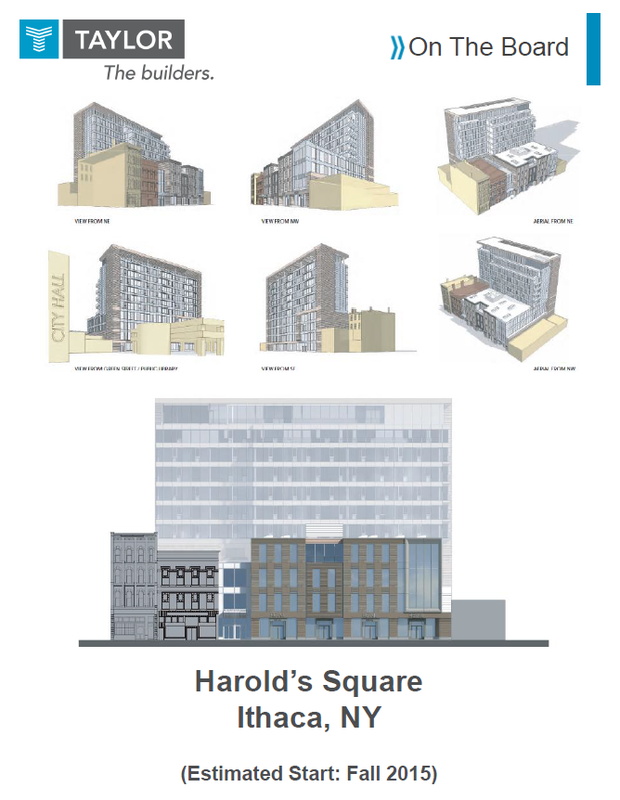 Other proposals are still trying to figure out financing, such as 323 Taughannock and Harold’s Square. Then there are projects that are just big question marks right now, like the Chapter House Rebuild. Maybe there will be some solid development there next year. 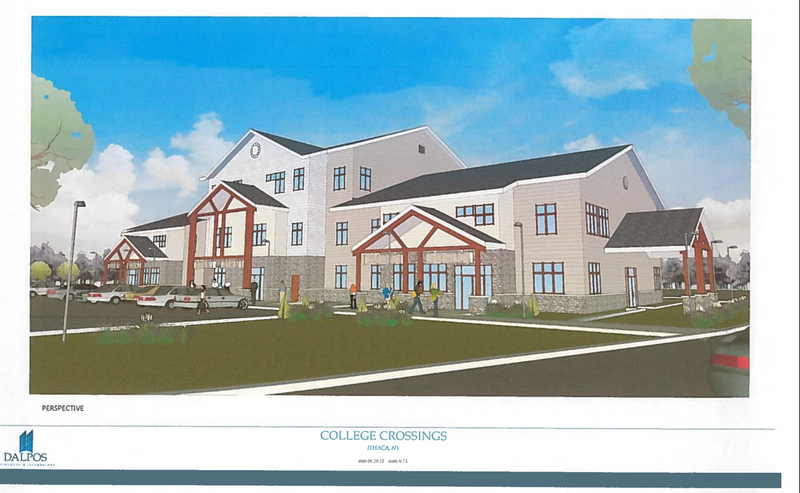 There are also new plans presented during the past 12 months – 815 South Aurora and 201 College from developer Todd Fox, Cornell presented plans for renovations to Hughes Hall, and to redevelop Maplewood Park. 1061 Dryden will be sparking the latest development debates in Varna. Lastly, a few plans bit the dust. State Street Triangle is probably the most well-known, but there were others such as INHS’s Greenways townhouse project, and College Crossings on South Hill. The owners of the SST site still want to redevelop it, but Campus Advantage won’t be involved. This past year definitely had its share of debates and controversies. Virtually every project from home lots to big buildings has some level of opposition, but some are particularly contentious. State Street Triangle, the Maguire plans, the bar once planned for 416-418 E. State, Black Oak Wind Farm. BOWF is especially worrying. With goals such as affordable housing and renewable energy, there are times Tompkins County’s residents seem to be their own biggest enemies. 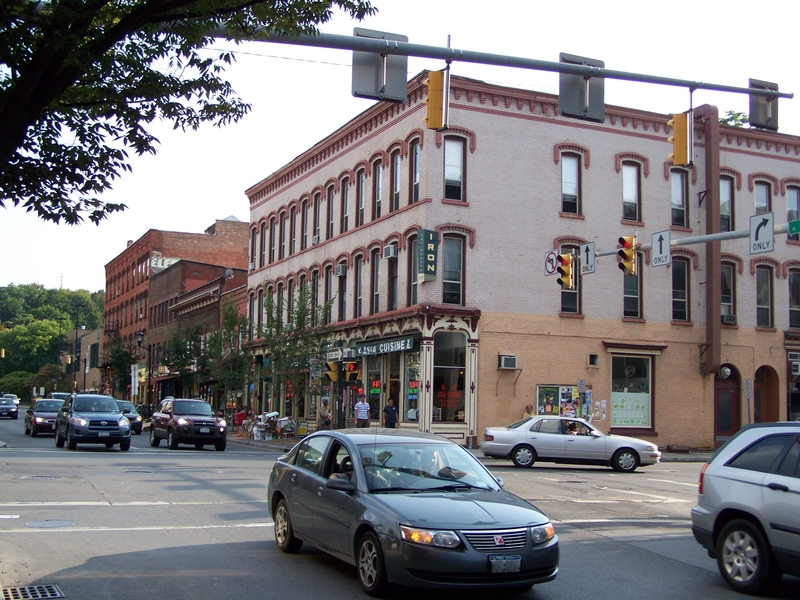 Some of my favorite posts this year include the two-part write-up about Ithaca’s Urban Renewal, and the analysis of 30 years of Tompkins County new construction permits. There were looks at the Fall Creek housing market and the NYSDOT Waterfront feasibility study. The Newfield UFO and the tour of STREAM Collaborative’s net-zero house offered diversions from the typical posts. Eight years is a long time, and there will be some major announcements later this year. Stay tuned. A little less fact and a little more opinion with this week’s Tuesday post. I postponed what I originally had planned because of a few things coming together at once. One, a post from Kathy Zahler at the Dryden Daily Kaz alleging ageism at work in the 4th District county legislature race, and this piece on the ever-evolving character of New York’s East Village from the Sunday New York Times. In the 4th District race, you have a 19 year-old candidate, and a 56 year-old candidate, both Ithaca natives. Reading their views on the issues, one can’t find a whole lot of differences, but the “he’s just a kid” type of comment raises its ugly head. I don’t claim to know why people vote the way they do, nor do I feel it appropriate to do endorsements. People will vote how they want. But it would be a real disappointment if age were being used as the deciding factor. It reminds me a lot of an Ithaca adage that people want Ithaca to look and feel exactly as it did when they moved here, or felt most in their element here. Which ties in pretty well to this NYT piece from last Sunday. Likewise, everyone has their own idea of Ithaca’s “Golden Era”, and when it ended. For many of the city’s oldest or most conservative residents, and for many older folks in the surrounding towns, it was when the Commons opened in 1974/75. It has just as much to do with the Commons itself as what the Commons represents – when Ithaca turned leftist. Up until the early 1970s, the city and county were run by Republicans. But, due mostly to the large influx of largely single–minded faculty at IC and Cornell in the late 1960s and 1970s, and a trend towards rentals in the city (then as now, students/young voters tend to be more liberal), the area started voting more and more Democrats into office. The last Republican mayor of Ithaca (Bill Shaw) left office in 1983. The last alderperson (Bob Romanowski), 1993. The national trend towards the right didn’t help, as Northeast Republicans generally trend to the moderate side. The Commons was a product of Democrat Ed Conley’s administration, and it’s often seen as a congregation site for social activists and crunchy boutique stores – head shops, organic specialty items, and the like. So it’s not hard to imagine why the Commons receives so much criticism, because for those who saw Ithaca’s best days as Republican ones, its opening signified the beginning of the end. You could go down any street and get a variety of numbers – for the more blue-collar folks, the end of the Golden Era might be 1983 (when Smith-Corona shut down most operations and BorgWarner Morse moved to Lansing), 1986/87 (when Ithaca Gun moved out), or 2011 (when Emerson Power laid off its last local staff). For those who have clung to the misguided image of Ithaca as a small town where nothing bad happens, the Ellis Hollow murders in 1989, or the stabbing death of IPD Officer Padula in the line of duty in 1996, might be when Ithaca’s Golden Age came to a close, and it became to them an alien, dangerous place. Still others will say Ithaca’s Golden Age closed when Wal-Mart opened (2005), when Cornell turned to the lake for its cooling needs (2000), or this year, when Moosewood decided to go national. The point is, Ithaca’s “Golden Era” ended at a different time for everyone; for some it’s still going. That’s because the community is always changing, evolving, remaking itself into something different from what it was. One of the things that I find bothersome is when one prefaces a comment with “I was born here in 1953/I moved here in 1977/I bought my house in Fall Creek in 1983…”. It doesn’t make one more “correct”, it doesn’t mean one’s opinion should have extra weight. For a community that prides itself on being so cosmopolitan for its size, bragging about the decades one has been in one place suggests insularity and close-mindedness. It’s like saying the community isn’t allowed to change without one’s explicit permission. My exposure to it is mostly from the perspective of development. Almost always, it’s how they’ve lived here for decades, and something will ruin the character of a neighborhood. People don’t like anything that impacts the feel of a place, which can be something major like the physical appearance of a new house or apartment building, or something more subtle, like the type of resident moving in. But as communities go, character was never intended to be a static object. That’s why you’ll have a building built in 1926, next to a pair of houses built in 1880, just west of an office built in 1972, and across the street from a building built in 2005. The average Tompkins County legislator is well into their 50s; the county’s average age is 30. Some might see a 19 year-old too young for office, I see a kid with a lot of potential and desire to work for his community. 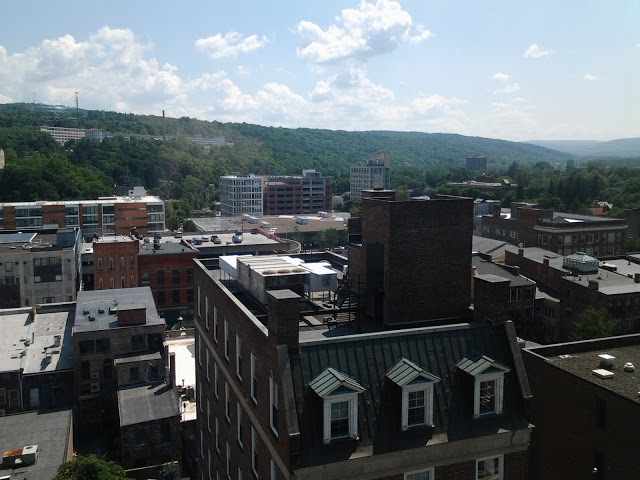 Ithaca is always transforming. People are born, they grow up, they age, they die, they move in, they move out. New thoughts awaken and old ways of thinking fade to the background. Change will happen, welcomed or otherwise. But at least if it’s welcomed, there’s the opportunity to guide it.